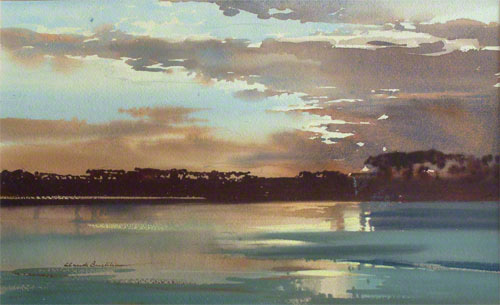 This is a good example of water colour painting to create an atmospheric image. The picture shows the sunset over the sea and beach with a line of trees in the back ground. The use of water colour to paint water and sky was a Claude Buckle specialty, well illustrated by this picture. This picture also shows how effective the water colour painting technique is for skys something which is difficult to achieve with the oil medium. Created in 1969.